Hornby Magazine Yearbook No 5 is completely themed around the former Midland Railway main line through the Derbyshire peak district to Manchester. The arrival of the Bachmann Midland Pullman in both OO and N gauge during 2012 make this a very topical theme. 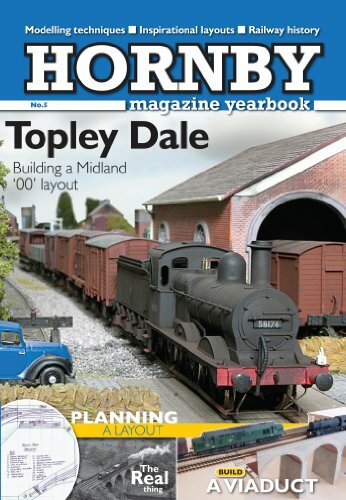 Coverage of Topley Dale is comprehensive and Hornby Magazine Yearbook No 5 is a self contained guide to building a working model railway from start to finish. Reviews of the Bacnmann Midland Pullman set. Although the Hornby Magazine Yearbook No 5 is effectively a thirteenth issue of the magazine, it is presented in casebound format as a standalone book, rather than as a magazine or bookazine as produced by competitors. It forms a great companion to Hornby Magazine and there is something there for both the beginner and the reasonably experienced modeller. The Hornby Magazine Yearbook forms a great christmas present and yearbook no 6 is already available to pre-order for November delivery.